Susana Tornero Brugués (Figueres, 1973), graduated in Translation and Interpretation Studies, lives in Barcelona, where she works as a translator and storyteller. Her linguistic training and her interest in various art forms (specially sing and dance, gestures and rhythms from different cultures) reflects in her storytelling, nourished by traditional forms that she brings to the here and now, reinterpreting them and searching the complicity of listening together. 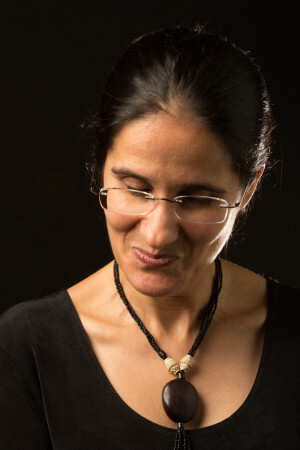 She has participated in different storytelling initiatives focused on language and cultural diversity, as a storyteller as well as organizer/coordinator, for different institutions, such as: Public Library Network of Barcelona, Ethnological Museum, French Institute, Barbier-Mueller Museum of Pre-Columbian Art, Caixaforum (Barcelona, Madrid, Lerida, Tarragona and Gerona), UNESCO Centre, French Lycee, Goethe Institute, Jaume Bofill Foundation and Contes pel Món Foundation. With Ignasi Potrony she constitutes the storytelling duet tàándem, a “two voices” project that she feels immensely rewarding, where they mix folktales, myths, gestures and rhythms, and they hold workshops for helping others to rediscover the pleasures of telling stories person-to-person or in small circles. At present they coordinate together the project Tantos cuentos, tantos mundos (So many tales, so many worlds), for La Caixa Foundation, a workshop for schools based on folktales from different cultures from all the world conceived by Ignasi Potrony and focused in discovering the beauty of cultural and personal diversity, as well as the joy of shared creativity. She has brought her stories to different festivals and institutions: Tibet House from Barcelona, Asian Festival of Barcelona, Harlem Jazz Club (Barcelona), La Campana de los Perdidos (Zaragoza), El Café de la Luna (Logroño), Libertad 8 (Madrid), Casa de las Conchas (Salamanca), Folktales Festival Kea (Greece), Baltica 2015 (Latvia), Festival Palabras al Viento from Celaya (Mexico), Festival Ziv Zup from Kuldiga (Latvia), Spanish Embassy in Nouakchott (Mauritania) and Conakry (Guinea). During her trips he could see up close that folktales shared by geographically distant peoples bring us together and allow us to recognize ourselves in one another. She is an active member of the Associació de Narradores i Narradors (ANIN) from Catalonia since 2005, where she has coordinated with Ignasi Potrony the project Mercat de Veus, where storytellers tell their stories in their own Catalan dialect, showing the richness of this language, for the Public Library Network from Barcelona (2010-2015), and she is currently part of the working group FEST Team from ANIN, which coordinates the relations with other storytelling associations at European level (FEST). She believes folktales are a basic and essential need to the human race from his origin, and considers storytelling as an art form from infinite possibilities. With folktales and folksongs, she aims to live orality in its ideal expression: group and face-to-face experience, ephemeral nature and permanence in the personal and collective imaginary.